The following is a Synopsis, Review and Critique of the 1981 movie "Superman II". "You will bow down before me, Jor-El. Both you, and then one day, your heirs!" Clark Kent bumbles into the offices of the Daily Planet. Clark is the modern day invisible man: no one pays any attention to Kent, seemingly passing through him as they go about their daily duties. Clark has returned from a brief vacation, and stops in to see Perry White who tells him that he needs to begin writing a background story on terrorists. Hostages are being held by terrorists in the Eiffel tower and Perry has already sent Lois to Paris on the Concord to cover the story. Realizing that Lois is in potential danger Clark slides out the door, even as Perry decides how the headline for a bombed Paris should read. Running out of the Planet Building, Clark darts into an alley, changes to Superman and speeds off for Paris. At the Parisian press conference, officials alert the media that the terrorists possess a hydrogen bomb and intend to set it off if the government does not give in to their demands, which they have no intention of doing. Lois decides that she must get to the top of the tower for the "inside scoop". Leaving a Gendarme trying to figure out the tourist's translation book of French phrases, Lois slips past security and heads up the tower stairs to an elevator on its way up to collect several freed hostages. Lois climbs underneath the elevator, and spelling P-U-L-I-T-Z-E-R P-R-I-Z-E, and N-O-B-E-L to quiet her nerves the elevator starts up. French police are not ones to mess with terrorists. Once the hostages are free, they intend to destroy the tower elevator with a bomb of their own. They don't realize that by doing so, they will set the timer of the H-bomb in motion and have only sixty seconds before detonation. Plastic explosives are placed, and the elevator drive is destroyed, sending the elevator containing the bomb, and Lois, plummeting to the ground. The emergency brakes come on to no avail. In the nick of time, Superman arrives, having flown across the Atlantic, speeds toward the tower, flies under the elevator and slows it to a stop. "Your floor" he says to Lois. "The bomb!" she screams. Superman nods, and lifts off pushing the elevator up, crashing through the roof of the tower. Guiding the elevator into space, Superman sends the bomb hurtling into the distance to explode, harmlessly, he thinks. The concussion wave from the explosion spreads shattering the Phantom Zone crystal which just happens to be floating past the moon. This frees the three Kryptonian villains who blithely head toward the moon, and the earth beyond. Back on earth, Clark starts across the street to join Lois, and looks rather bewildered after a taxi has crashed into his legs. Joining Lois in her office, she once again begins comparing Superman to Clark. As usual, the curious two-sided triangle is present as Clark, even though he is Superman, he acts rather schizophrenic seemingly existing individually as both Clark and Superman. He hears Lois speak so lovingly of Superman, yet cringes at the words that have been man's bane since time began, "You're a good friend, Clark", even though he knows that they are one and the same. In prison, Luthor and Otis have been assigned to laundry detail. But even that does not impede the crafty Luthor who hatches a new plan to escape and get revenge. "Everytime they try to track him with radar, Superman just flies off" says Otis. "Where?" asks Luthor. "North, Mr. Luthor" says Otis. "Why?" "To ski?" asks Otis. "Otis, every man has his vulnerable point. Some, like you have more than one. I didn't see Superman's until it was too late. But, now, through patience, invention and skill, my little black box is almost ready. That little black box goes beyond conventional radar. It tracks Alpha Waves. Those Alpha waves will take me north to his secret. And his secret will give me Superman." Zod, Ursa and Non arrive on the moon. The Apollo mission, Artemus, with two American astronauts and one cosmonaut is the first joint Russian-American moon mission. While exploring the lunar surface, Ursa makes first contact with one of the men. The astronaut stands, mouth agape, looking at the woman wearing no space suit. "What sort of creature are you?" she asks. "I'm just a man." "Just a man?" asks Ursa, who then reaches out to take a patch off of the American's space-suit. Panicked, he tries to escape but Ursa flies after him and rips the patch off of the suit now exposing him to the vacuum of space. In an instant, he is dead. Mistaking the astronaut's radio transmissions to Houston Space Center as the planet's name, the three villains stand on the moon reveling in their new abilities. But where to go? The earth, eclipsing the sun, gleams like a blue green ball. The trio heads off to the planet Houston. They aren't looking to visit, they intend to conquer. It's lights out in the prison, but the lights in Luthor's cell don't go off. The guard enters Luthor's cell only to find that what he thinks is Luthor and Otis playing chess is really a 3-D projection from another of Luthor's creations. Luthor and Otis have escaped. Miss Tessmacher is in a hot air balloon, which she has flown over the prison walls. Letting down a ladder, Luthor climbs up, but as Otis tries to climb, he pulls the balloon down. Luthor cuts the ladder, and Otis can only wave as the balloon drifts away and guards and dogs apprehend Otis. "What is ballast for?" says Luthor. Perry has sent Lois and Clark to Niagara Falls to pose as newlyweds in an undercover attempt to expose the corruption in the "honeymoon" industry. Amongst the tacky atmosphere of the hotel, a pink polyester bear rug, cheap champagne, heart shaped bath tub and a motorized bed, Clark is enjoying pretending that he and Lois are married. Lois basically ignores him pointing to the complementary couch where Clark is going to sleep. The next day is spent sight-seeing. But, seeing all of the honeymooners and happy couples, Clark wanes romantic and asks if he can hold Lois' hand. Lois allows Clark to take her hand, but is obviously non-plussed by it all preferring to stare over the rail to the falls. The mist fogs Clark's glasses and when Lois pulls them off of his face to wipe them, she stops short when she begins to hand them back. The face is Clark, but no! Someone else. Clark quickly pulls on his glasses and in an attempt to divert her attention offers to get Lois her favorite meal, a hamburger and orange juice. As he walks to the refreshment stand, a boy playing on the rail overlooking the falls slips, and Lois screams for help as the boy disappears into the mist. In an instant, the Man of Steel arrives and saves the boy, flying him back to the observation deck. After chiding the boy for playing too close to the edge, Superman flies away, seemingly ignoring Lois altogether. Lois obviously feels snubbed and wonders why Superman just happened to be in Niagara Falls, and by the way, "where's Clark?" Superman lands behind the refreshment stand under cover of the confusion of the rescue and changes back to Clark. Bringing her hamburger to her, Lois asks, "Where were you?" "Getting your hamburger" says Clark. "Everytime Superman's here, you disappear" says Lois. "Golly darn," says Clark, "forgot your orange juice." In the meantime, Luthor and Miss Tessmacher still head north. Eventually they find the Fortress of Solitude and once inside, they discover the control panel which Luthor uses to watch holograms from Krypton. Lara, Keeper of Archives of Krypton, and Kal-El's mother, appears and answers Luthor's questions about Krypton and especially Krypton's criminals. "On Krypton there was no death penalty, so heinous crimes were punished by imprisonment in the Phantom Zone for all eternity." "Think of it. Three super-villains. Each with the same powers as Superman. Each one completely dedicated to evil and corruption. They have the same contempt for life liberty and pursuit of happiness that I do. They will need a contact on earth." Back in Niagara Falls, Clark and Lois stand next to an exhibit of all those that have attempted to go over the falls. "Your disguise is nearly perfect," she says to an astonished Clark. "You had me fooled and I'm no one's fool. If I'm right, you'll change to Superman and save me. If not, well, you've got one hell of a story!" With that, Lois jumps into the Niagara River and is swept away. Panicked, Clark runs down the shore of the river searching for something that he can use to help save Lois without revealing himself. Finally, he sees what he needs and burns off a tree branch with his heat vision. It falls into the river and Lois is able to grab it. She maneuvers herself to a calm spot in the river. Clark tries to pull her up, but is instead pulled into the river himself, and it is Lois who has to save Clark. "You're who I thought was Superman? How embarrassing." Eventually, the three Kryptonians arrive on earth, at a quiet fishing lake. While Ursa and Non put down on solid ground, Zod descends into the lake. He has never seen anything like water on the crystalline Krypton, and finds it all rather odd. Zod seemingly levitates then walks across the water to the shore. Little by little they discover the powers they gain from the yellow sun of earth. The ever-curious Ursa finds a rattlesnake and picks it up to study. However, the snake bites her and without thinking, she fries it with her heat vision. "Did you see what I did?" she asks. "Yes, my dear. We all have those powers" says Zod. They may indeed, but the child-like Non has not quite mastered them quite yet. Back in the lodge, Lois is lamenting her actions, thinking how stupid she is. Bringing Lois' hair brush to her, Clark trips and falls into the fire place. Fearing that his hand is burned, Lois jumps up to help. But there are no burns. "You are Superman." Clark turns and walks to the bed. Before your eyes, he grows taller and his shoulders grow wider. "We'd better talk" says Clark. "I'm in love with you" says Lois. "Then we'd really better talk. Let's go to my place" he says and the two head north to the Fortress. Once there, he gives Lois a tour, explaining to her that the green crystal he hands to her to examine actually called him to build this place and to be Superman. Superman wants to make this day special and flies off to Hawaii to pick a Bird of Paradise, and to France for champagne and gourmet food. In a thoughtful reflection, Lois leans back to look at the Fortress and casually drops the mystical green crystal in the snow. The trio from Krypton now find their way to East Houston, Idaho, a small farming town. On the backroads, they happen upon the sheriff and his deputy on rounds. [Clifton Jones, who played JW Pepper in the James Bond movies Live and Let Die and Man With the Golden Gun plays the sheriff.] Thinking that they are "Hippies from LA", his deputy tries to have them get out of the way. Here, Zod uses one of the here-to-for unknown Kryptonian superpowers. His heat vision can also levitate objects. Ursa takes the deputy's badge and Non rips the red-light off of the top of the sheriff's car, giving it to Zod as a memory of Krypton's red sun. In the town, a young boy is the first to see the Kryptonians. Non is still practicing his heat vision when Ursa walks into the local lunch counter and challenges one of the locals to an arm wrestle. The red-neck doesn't expect much competition until Ursa breaks his arm though the table. Zod rolls his eyes in disgust at Ursa's brazen move but when one of the red-neck's friends stands up for his buddy, he nonchalantly throws him through the wall, through a truckload of chickens and out into the street. Using another new power, Zod uses his finger to levitate a townsperson many feet in the air. When the man's son pleads for Zod to stop, he shows his total disregard for human life by walking away, letting the man fall to the ground. Predictably, the army moves in to attack. Almost as if showing off, Non steps forward and blows out the tires of a jeep with his heat vision. Zod then blows the flames from a flame thrower back at the soldiers, and he and Ursa combine their super-breath to down a helicopter. "Is there no one that can challenge me?" asks Zod. In the Fortress, Lois and Superman have a romantic dinner. They talk about Clark, and even Superman treats Clark as if he is a separate entity. When Lois tells Superman that she needs to put on something a little more comfortable (even though she brought no suitcase or clothes on the flight), Superman takes the opportunity to confer with Lara, his mother, for advice on matters. "If you are to live your life with a mortal, you must become a mortal" she says. "You will give up all of your powers. There is no return. Once done, you can't go back. Are you sure?" Superman nods and enters a red, crystal chamber. Once energized, the chamber removes Superman's power and he emerges not as Superman, but as Clark Kent. While Superman/Clark sleeps with Lois; Zod, Ursa and Non continue to reek havoc: they reconstruct Mt. Rushmore, then challenge the troops to enter the White House. They plow through the troops to get to the Oval Office. On the floor is a carpet with the American seal, a large eagle. "I see that you are practiced in worshipping things that fly". Zod calls for the president and tells him to kneel. "You are not the president. You kneel too fast for someone that leads so many." The real president comes forward. "I will kneel if it will save lives," he says. "It will" says Zod, "starting with your own." "Oh, God" says the President. "No. Zod!" Lois and Clark make their way back to Metropolis from the Arctic. It is not explained how they got south, or where they got a car, but they pull into a diner so Lois can have a hotdog. They choose some seats at the end of the counter and Clark heads to the men's room. A local bully named "Rocky" (Pepper Martin) takes Clark's seat. Clark, now the protective lover, challenges Rocky to a fight. "Would you like to step outside?" Clark asks. "After you four-eyes", he says and as Clark turns to go outside, Rocky punches him from behind. Clark lies on the floor, bleeding and Lois comes to comfort him. "I bet you wish Superman were here," says Clark. "I want the man I fell in love with," says Lois. "I wish he were here," says Clark. With a new resolve, Clark re-attacks Rocky, who again, knocks him to the floor. Trying to calm the place down, the owners turn on the television. National television features the President addressing the nation, telling them that he has abdicated his powers to Zod. In a desperate move, the President screams, "Superman, where are you!" Zod stares into the television camera. "Come to me Superman, if you dare." In each Superman movie, there is a major plot flaw which is never explained, yet has major impact on the story. In this film, Superman has already entered the crystal chamber, which removed his powers. Lara has told him that once done, he can never go back and that he will remain a mortal. Yet, Clark, beaten and bloodied, having no gloves or boots and wearing only a light jacket, heads back north. The Messiah may have fallen, but now seeks redemption. Clark hikes onward, through a blizzard, through the snow and cold, finally reaching the Fortress of Solitude. Entering the fortress, Clark can do nothing but scream in frustration. "I've failed!" he screams. He pleads for help from his mother and father, but in the Fortress his pleas go unheard, only echoing off of the crystalline walls. Walking to the control panel, the crystals flake in his hands; all is dust. But, then, to his right he sees a faint light. The glint of the green crystal Lois had dropped in the snow; still preserved, it's light shines above all else. Inside the White House, the Kryptonians plot their next move. To their surprise, a brazen human, Lex Luthor, walks into the room to introduce himself to Zod. His bravado catches them off guard, especially when he tells them that he wants is to be the emperor of Australia. "I have a thing for ocean front property," he says. But what does he have to offer? He tells Zod that Superman is the son of Jor-El and says that he can deliver Superman for Zod's revenge. "Welcome, Lex, Luthor, ruler of Australia", says Zod. Back at the Planet, Perry, Lois and Jimmy wonder where Superman could be. Normally, Superman would have been there at the first hint of trouble, yet he is no where to be seen. Suddenly, Non crashes through the offices, followed by an unamused Zod, Ursa and Luthor. When Perry moves towards Zod, he lifts Perry through the ceiling. In a futile attempt, Lois hurts her hand trying to hit Ursa. Luthor tells them that Lois is "Superman's Girlfriend" and could be the key in tempting Superman to show himself. "If that is so," says Zod, "kill the rest, including Luthor." Suddenly, among the stillness of the city's desperation a wind whips by and a fully rejuvenated Superman appears on the flagpole outside of Perry's office. "Care to step outside, Zod?" "Come to me son of Jor-El. Kneel before Zod." First, Zod attacks by throwing a large concrete block at Superman. He uses his heat vision to blow it up before it can hit him. Then Non attacks. Superman knocks him into the tower on the top of the Empire State Building. The tower falls off the building tumbling to the street below. Superman grabs it just in time to save a woman pushing her child in a carriage. Zod comments, "He cares for these earth people." "Like pets?" asks Ursa. "I suppose so." Zod then uses his heat vision to blow up cars in the street and seeing a stalled tanker truck turns his heat vision on it's gas tank. Superman uses the trucks mirror to reflect the beam back at Zod, then uses superbreath to freeze the tank. The reflected heat vision explodes on Zod, charring a billboard behind him leaving only the words "Cool it." Standing in the street, Superman is caught off-guard when Non attacks from above, knocking him completely through the pavement into the sewers beneath the street. The earth shakes as they battle, and among the grunts, manhole covers explode down the street. Superman finally punches Non through the asphalt, through the Planet building and out over the river. Ursa makes here move by throwing a manhole cover at Superman, knocking him onto a car and breaking the windshield. Zod takes the advantage, landing on the hood of the car. Wrestling on the roof of the car, with the occupants still inside, Zod throws Superman through a truck. Superman rushes back and grabs Zod, spinning him around his head and sending him flying into a giant Coca Cola sign. Non and Ursa then pick up a bus full of people. Superman screams for them to stop, but instead they throw it down the street. Superman tries to stop the bus, but the force drives him back, crashing into another truck. Once stopped, the people start climbing out of the bus but Superman is quiet. People think that he has been killed and take up arms, rocks or sticks in an attempt to fight off the Kryptonians. Zod uses super-breath to blow them back. Cars are flying through the air and the whole area is destroyed. Finally, Superman crawls out from behind the bus. He realizes that many lives are at stake and that Zod has no regard for human life. If the battle continues here, more than just property will be lost. Superman decides that he must leave Metropolis and go to a more secluded area, even though the people do not understand what he is doing and scream for him not to leave them. Thinking that they have won, the three Kryptonians return to the Planet building. Again, Zod is about to kill Luthor when Luthor offers another tidbit: he tells them that he knows where Superman has gone and how to trap him. The Kryptonians grab Lois and Luthor and fly north to the Fortress. Upon seeing the Kryptonian architecture, Zod can only comment, "A sentimental replica of a planet long dead." Superman steps from a corridor to reveal himself. "I expected better manners" says Superman. Non tries to strike first and flies at Superman. To every one's surprise Superman literally peels of a cellophane replica of his "S" emblem and throws it at Non. In mid-air, it grows and captures Non like a fly in a spider web. One by one, more new powers are revealed. The Kryptonians attack Superman with a ray emanating from their fingers. Superman seems to catch these energy bolts and throw them back at them with even greater force. Then, each of them disappear and reappear, first teleporting, then appearing in multiple images. One of the images is the real Superman who comes up behind Zod and puts him in a head lock. In retaliation, Ursa and Non quickly grab Lois and Zod tells them to rip her in half. Superman has no recourse but to release Zod, who then demands that Superman be his eternal slave. Having seemingly won, and seeing no further reason to keep him alive, Zod tells Ursa to, once again, kill Luthor. Luthor goes to Superman complaining of treachery: "Promises were made, gifts were exchanged." In a rash move, Superman appears to take Luthor in his confidence and asks Luthor to help him maneuver the Kryptonians into the molecule chamber to remove their powers. Yet, in a predictable fashion, Luthor turns on Superman and tells Zod of the plan. "Hey, you did it to them" says Luthor realizing that Superman had rearranged the chamber and protecting himself this time. "I knew you'd double cross me Luthor. A lying weasel like you couldn't resist the chance." Luthor is amazed that Superman has turned the tides and tries to quickly cover himself. "Hey, I was with you all of the time. Let's wipe the slate clean. We'll go back to Metropolis, I'll turn over a whole new leaf..." With Luthor chattering on, Superman leaves Luthor standing in the Arctic and flies Lois back to Metropolis. The two are quiet for most of the flight. "I'll never fly with you again" says Lois. "Sure you will" says Superman, although the tone of his voice is not convincing. "I'll never tell them who you are." "I know, Lois." On Lois' balcony, the two lovers glance at each other, not knowing what is to happen next. Superman turns, and flies quietly away. Only a quiet, "See ya' later," lingers in the air of the night. The next morning, repairs are being made to the Planet offices, when Clark takes off his ill-fitting hat and enters Lois' cubicle. No one seems to have noticed that Clark was absent last night. Again, he is the invisible man. Lois looks horrible. She has been crying all night. "How are you," he asks. "Don't worry about me," she says. "I like worrying about you," says Clark, tenderly. But Lois reacts. "You just stop. Don't you know that this is killing me? I can't talk to you, or show feelings, I don't even know what to call you." "I don't know what to say," says Clark powerless. "Just say you love me," says Lois. Clark carefully wipes away her tears, and lovingly, tenderly kisses Lois. The kiss miraculously erases the memory of the last few days. Like Dorothy returning from Oz, Lois is confused, but undaunted, resuming as if nothing has happened. "What was I thinking about," she asks. "Probably about Superman, if I know you," says Marie, Lois' secretary. "Not him again," says Clark. "Clark, you shouldn't compare yourself to Superman." Asking if he can help, Lois says, "You could get me a hamburger and OJ." "A hamburger, at nine in the morning," Clark whines. But he dutifully leaves to get the food, looking over his shoulder only to see that the woman he loves has been spared her pain. Lois turns to her friend and says, "What's happening in the world?" Her friend looks at her completely baffled. "Hmmm," says Lois. "Let's see what trouble I can get in today." In the Alaskan Diner, Rocky is still bullying the occupants once again. Everyone is surprised to see Clark open the door. He points to Rocky and says, "Excuse me sir, but I think you're in my favorite stool". The every-cocky Rocky says, "Why don't you come over and take it." Predictably, Rocky tries to strike first, but only the bones of his own hand crack when he hits Clark in the stomach. Clark lifts him onto the stool, spins him around and sends him down the counter into a pin-ball machine. "This order's to go," he tells the cook. Clark apologizes to the unbelieving, open-mouthed owners and gives him money for repairs. "I've been working out," he says casually. With the American flag held firmly in both hands, Superman flies to the White House. Standing above the shattered roof, he looks down at the President and the Joint Chiefs. "I'm sorry I've been away so long," he says. "I won't let you down again." Above the clouds, Superman flies over the earth keeping watch. In a graceful sweep, he flies into our line of sight. He has returned after going astray, and is now ever vigilant, always watching. He will always be there, and all is again right with the world. The production of Superman II began with several controversies. First, Marlon Brando, who really did not want to appear in the second film, demanded the then unheard of salary of five million dollars to reprise his role as Jor-El. Considering that his on screen time was to be less than 15 minutes, the producers opted to use Suzannah York, who had portrayed Kal-El's mother, Lara, in the first film, in his stead. To retain continuity, she was referred to as the "Keeper of the Archives of Krypton". The second controversy occurred with a change in directors. Richard Donner had originally filmed Superman I and II almost concomitantly. However, Mario Puzo wanted to explore both the range of human feelings and sexuality of Superman, actually promising the press that he would insure that Superman and Lois slept together in the film. When Donner balked at this, Puzo threatened to pull out of the project and the Salkinds decided to replace Donner rather than let Puzo leave. Richard Lester was hired and essentially re-filmed all but a few scenes of the movie. The location of Donner's original movie print is unknown, and the public has never seen this version. In several interviews regarding that version of the film, Donner said that his Lois was more intuitive than the Lester version and tried to trick Clark into revealing his identity by jumping out of the Daily Planet window. Clark raced to the ground floor and used his super-breath to inflate the awnings of all of the windows up to the Daily Planet offices that broke Lois' fall to the street below. As Lois, comes to rest in the last awning just above street level, she looks up, sees Clark staring down at her from the window she fell from, and faints. ABC-TV and CTV (Canadian) did use some of the original Donner footage (along with commercials) to expand the movie to 2 hr 21 min for television broadcast over two nights. There are some interesting differences between the two television versions. In the American version, the White House fight scene goes on for nearly 4 minutes, while that scene is no more than one minute in the CTV version. Also in the US version, Superman uses his heat vision to cook a souffle for his dinner with Lois in the Fortress while this was cut in the Canadian version. In both versions, Superman destroys the Fortress of Solitude (which somehow reappears in Superman IV) at the end of this film. However, this takes only 30 seconds in the US version, while the CTV versions uses the time it saved by cutting the White House fight scene to insert 5 minutes of important conversation between Superman and Lois as they profess their mutual love and loss to each. The special effects in "Superman II" were every bit as good as those present near the end of "Superman". I enjoyed witnessing the final climactic battle against the Phantom Zone criminals and the special effects made the fight scenes exciting and entertaining. One especially cool scene includes General Zod smashing into a Coca-Cola sign and being caught in the explosion. Also, the heat vision scene where Supes reflects Zod's heat vision back at him with a mirror, from a gasoline-filled truck, and the billboard behind him, which originally says "Some Like it Hot: Cool It Air Conditioning Systems" is burned away, and all that is left behind is "Cool It." The flying is another aspect of the movie that is spectacular and incredibly believable, as is Zod walking on water and the carnage and destruction of the tanks and various weapons that attack the criminals of the Phantom Zone throughout the movie. Stamp's performance as the cunning and evil leader of the "Phantom Zoners" made Lex Luthor almost seem like the good guy. His acting showed off Zod's insane demands and deadly power that would give him such an advantage against the people of Earth and even Superman. Terrance Stamp played his role well, showing off the ever-confident and always plotting Zod, who would stop at nothing to crush everything in his grip. One of the many interesting aspects of the story of the Kryptonians is their need to learn about Earth and its inhabitants. Zod seems to begin to notice the different powers that the Earth's sun has granted them. It is also interesting to witness his discussions with Ursa, as they try and decipher Superman's weaknesses and the human beings' way of life. Almost an equivalent of Zod, Sarah Douglas' Ursa helped to complete a very interesting and intriguing aspect of the movie. The tension between Lois and her is very interesting to watch, as are her discussions, which are based on figuring out what human beings are. One of the most entertaining things, however, is Ursa's continued fascination of symbols. Ursa, although extremely clueless as to what is going on, is obviously the most interested in the explanation of the events that occur. 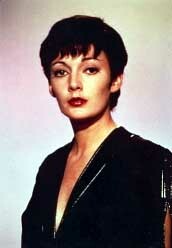 Ursa was very well acted and performed, never faltering the evil and wicked persona of a member of the Phantom Zone. Okay, this one's a little hard to determine. Especially since he had no speaking lines throughout the entire movie. Nevertheless, he served as an important part in fighting the Man of Steel, and, although he was extremely stupid and clumsy, the actor portrayed this well. The problem with this story was a plot hole. A major plot hole. Do those two sentences sound familiar? They should. They are the same two sentences that I used for Superman I, and there's good reason, also. How did Superman get his powers back? How did Superman get a car to go to the diner near his Fortress of Solitude? How does Lois get back to Metropolis? How could the director leave these parts out? The only clue that the audience is given on how Supes gets his powers back, is by a green crystal that created the Fortress of Solitude to begin with. So what? What does that have to do with anything? Plus, Lara already told him that there was no way to get his powers back after he lost them. We simply see Clark looking at the green crystal and the next scene features him flying outside of the Planet office, challenging Zod to "step outside". Why did they do this to a movie that was going so well? Although, very slow in getting to the part where Superman faces the Kryptonians, the end scenes are worth it. One more question, yeah, I know, I've asked a lot: Why did Superman not check back on his country after a while? Zod practically takes over Earth while Superman is with Lois! Not too good. How many new super powers were introduced in this installment? Let's see... levitating powers (Zod picks up the sheriffs gun by using the "force"), magic kisses (that erase one's memory), the ability to teleport and show mirror images of oneself, and many more. These were never in the comics and they just kind of sneak their way into this installment. If they had at least shown them in the first movie, it wouldn't have been as bad, but they just kind of appear, without rhyme or reason, breaking the audiences' imaginary boundaries of how Superman will deal with them. You begin to try and figure out how Supes will deal with these problems, based on the powers you know that he has and then, suddenly, they introduce some new power that has nothing to do with what you've seen before! The final thing that puts this down a few notches, however, is the fact that: Superman does NOT kill. (I'm sure it's written in stone somewhere) Even if he DID kill, it would only be because he had no other choice. With no powers, the Phantom Zone criminals could have been placed in jail! Yet, Supes seems to casually eradicate the Phantom Zone criminals at the end. He crushes Zod's hand, picks him up and throws him against a distant wall, causing him to fall in the abyss. Lois pushes Ursa off and Nod commits suicide, by accident. Superman could have saved all three of these villains, but he chose not to. 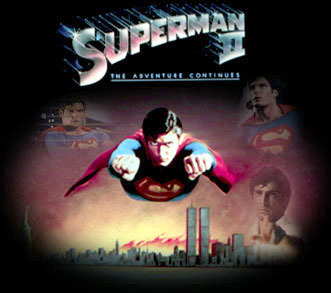 Superman II was an excellent sequel to the first Superman movie. It completed the circle of the beginning of the first movie, in which Zod swears that Jor-El and his family will "bow down before him". Luthor is wonderful and devious, adding more fun to the movie, along with some humor. Also, Superman finally confronts a problem in which he must use his brains to stop a group that, with their powers combined, are more powerful than he. Finally, everything works out in the end, bringing the audience another wonderfully entertaining Superman movie. Too bad the next two movies couldn't do the same!